Erik Simula spent the summer of 2009 paddling 1,000-miles across the Minnesota Arrowhead in his hand-made birch bark canoe, with only his dog “Kitigan” for company. Following traditional trails Erik lives off the land as much as possible, fishing, and eating wild rice for food. In this charming film, Erik paddles on Lake Superior and in the Boundary waters area. 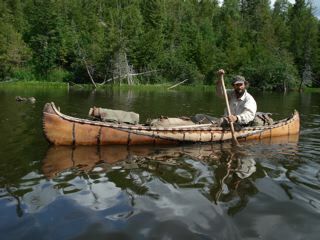 He mends his canoe in the field, and talks about his passion for wild places and all things birchbark.